It's a busy time of year, so make it easy in the kitchen with Banquet dinners and pot pies, as well as products from Chef Boyardee. 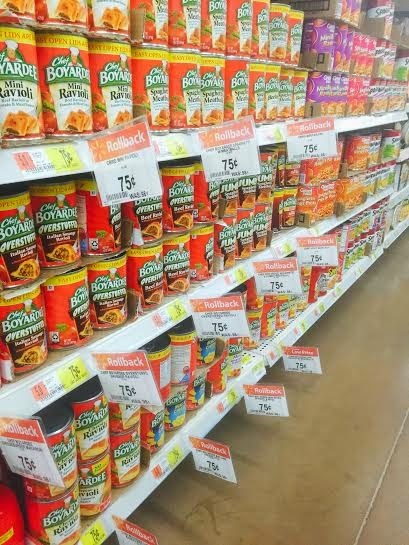 The rollback prices on Chef Boyardee cans and frozen Banquet dinners and pot pies make it simple to save and spend less time in the kitchen. Tasty meals like Banquet salisbury steak and Chef Boyardee raviolis make dinner easy and delicious. Be sure to head to Walmart and stock up on this great deal while supplies last. Frozen Banquet dinners -- $0.80 for each frozen Banquet dinner and pot pie now through Feb. 24. Chef Boyardee cans -- $0.75 for each 14.5-15 oz can of Chef Boyardee now through March 16. While shopping at Walmart, be sure to look for the Rollback signs for Banquet in the freezer section and Chef Boyardee in the canned food aisle.